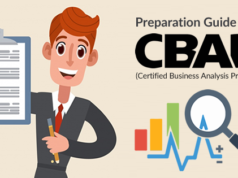 Blog Business Analysis How to Prepare for ECBA Certification Exam? How to Prepare for ECBA Certification Exam? Preparing for the ECBA Certification Exam? We’ve got you covered. The Entry Certificate in Business Analysis (ECBA) is the certification offered by IIBA. The ECBA certification exam tests the candidate’s knowledge and understanding in the field of business analysis. Thus, this certification exam recognizes entry level individual in business analysis domain. ECBA is an entry-level certification exam for the business analysts that was introduced in October 2016. This certification exam is to recognize the competency of entry-level as well as less-experienced business analysts. Who can Apply for ECBA Certification? ECBA exam is an online web-based exam that anyone can give from anywhere. All that is required to take ECBA exam is a desktop or laptop, working webcam, microphone, and an active internet connection. One who wants to appear in the ECBA exam doesn’t require any Business Analysis experience. So, if you are interested to learn business analysis and make a career in the field of business analysis, ECBA is the perfect certification for you. One needn’t go anywhere to take ECBA exam, you can take it even from your home. All you need is a computer/laptop, microphone, webcam, and an internet connection. There is not any prerequisite or recertification associated with ECBA certification like other business analysis certification exams. The ECBA certification cost is comparatively lower than that of the other business analysis certification exams. 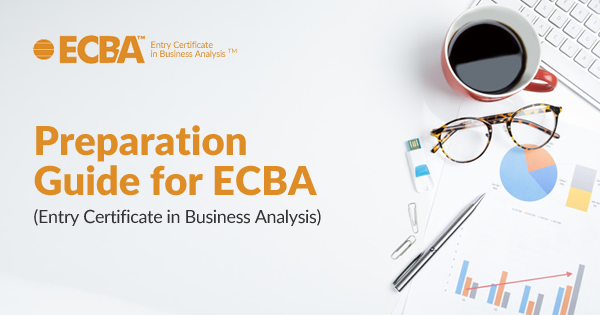 So, if you are new in business analysis domain and want to demonstrate your business analysis knowledge, ECBA is a go-to-certification for you. There are two significant components to pass and master ECBA – clarification of BABOK concepts and attempting sufficient ECBA practice questions. It is not mandatory for the aspirants to take instructor-led training for the ECBA exam, preparing through BABOK is enough to cover the exam objectives of the ECBA exam. The questions that arrive in ECBA certification exam are not so typical. These are the direct questions that come from the BABOK guide. Preparing for ECBA exam? Check your current level of preparation with ECBA Practice Tests! Are you new to the business analysis field? If yes, before preceding to the certification, you need to understand and get familiar with the basic concepts of business analysis. Read the definition of business analysis and understand how does it work. To make a career in business analysis, it is also important to know about software development and various phases of software development. It will help you to understand and learn more about BABOK guide. The ECBA certification has an explicit and focused content. So, it is highly recommendable to go through BABOK guide before you explore the ECBA exam focus areas in detail. Once you have read and understood the BABOK guide completely, it’s the right time to explore the ECBA exam objectives to have an in-depth understanding of the exam objectives. In order to clear the ECBA certification exam, it is required to cover all the knowledge areas of the ECBA exam blueprint. If you don’t have much knowledge about the ECBA exam objectives, join ECBA certification training by any of the IIBA EEPs to prepare yourself for the exam. There are so many Endorsed Education Providers (EEP) that are recognized and authorized by International Institute of Business Analysis (IIBA) mentioned on the IIBA website. These are the business analysis training providers for the preparation of ECBA exam. So, you can find one in or near to your location and start the training. Whenever we talk about ECBA certification preparation, practice tests and mock tests play an important role. When you are done with your preparation through BABOK and ECBA EEP course, the next step is to check your preparation level through ECBA practice tests. It is recommended to take practice test based on different knowledge areas first. When you will reach the passing score of minimum 80% then you can try full-length practice tests. It is advisable to take full tests before 2-3 days of the actual exam. If you continue to score 80% or above consistently in the ECBA mock test, you are ready to pass the ECBA certification exam in the first attempt. Always keep in mind to prepare through the best ECBA practice tests to ensure your success in the ECBA exam. Whizlabs is aimed to help you build a bright career and so bring best-in-industry ECBA practice tests for you to pass the ECBA certification in the first attempt. Go through Frequently Asked Questions (FAQs) for ECBA certification exam given on the IIBA website. Become a member of Business Analysis study groups and discussion forums; Whizlabs forum is the one you can opt. Join local IIBA meetings to make sure you’ve got and reviewed all the available study material. Make sure that the questions in the ECBA tests are not expected to be application-based, perspective-based or techniques-based. Focus on BABOK and go through it multiple times as maximum of the questions in ECBA exam are BABOK based. Set your preparation plan and prioritize the preparation structure on the basis of the weight of the exam objectives. Read each chapter of the BABOK one by one reading every line and prepare notes so that you can take a revision day before the exam. Start your practice by practicing the knowledge areas first, score well, and then move to the full-length practice tests. By following the above-mentioned ECBA exam preparation guide and tips, you will be confident enough to pass the ECBA certification exam in your first take. Still in doubt while choosing Business Analysis certification? Read our previous blog on the requirement of certification to grow in Business Analysis field. 1. Is ECBA certification for those who are new in the business analysis domain? 2. 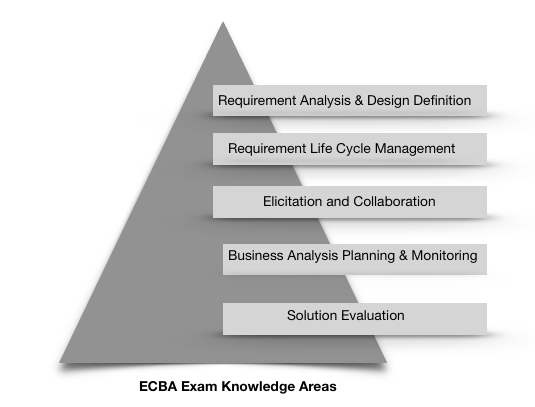 What is the exam format for ECBA certification? The ECBA certification exam is based on multiple-choice questions. You will get the duration of 1 hour to complete 50 multiple choice questions. 3. Is there any negative marking in ECBA certification exam? No, there is no negative marking in ECBA certification exam so it is recommended to attempt all the questions in the exam. 4. What is the syllabus covered in ECBA certification exam? 5. What is the exam fee for ECBA certification? 6. How can I take the ECBA exam? You can take ECBA exam anytime from anywhere. The ECBA exam is conducted by PSI and one does not require to go to any center to take the test. All you need is Computer, Webcam, Microphone, and the Internet Connection. 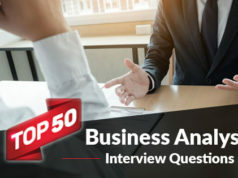 To cover up, Entry Certificate in Business Analysis (ECBA) exam helps entry-level business analysts to validate and demonstrate their business analysis knowledge and skills. If you are an aspirant to pass the ECBA certification, this ECBA preparation guide will help you reach the goal. At Whizlabs, we are strived to help professionals to get their career one level up. And thus, we bring ECBA mock tests for you so that you can practice through these mock tests and check your current level of preparation. So, are you ready to become a Certified Business Analyst? Have any questions or concerns? Just write down in the comment box or submit your query here, we’ll be happy to solve it! 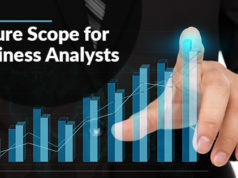 What is the Future Scope for Business Analyst? How to Prepare for CBAP Certification Exam? How long does it take for one to complete this exam? What are the steps involved to give the exam? How Can I Get The IIBA BABOK V3 Guide Book?